Calliope is a traveller in an ocean of clouds. Finding herself stranded on a floating island she hitches a ride with an old man travelling with mysterious valuable cargo. 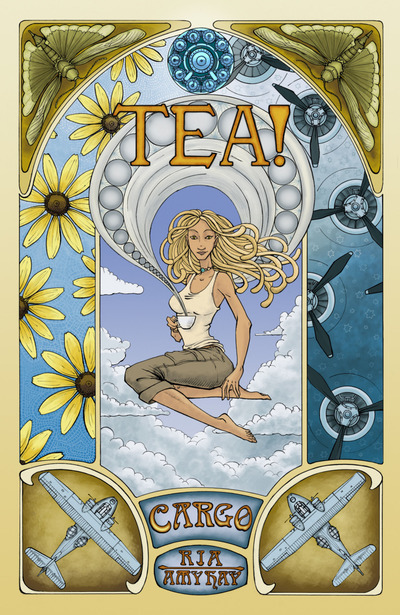 The title got my attention as a big tea lover, but mainly I purchased it because of the lovely, art noveau style cover. It also fitted in with my quest to read more comics written and/or drawn by women. The story so far is simply told with very little dialogue. The art is by Amy Hay, with writing by Ria. Certain panels are so beautiful I would happily frame them and put them on my wall. The style in which the people are drawn reminds me a little of the art of Trudy Cooper of Platinum Grit, and since PG is my all time favourite comic that is about the greatest compliment I can pay an up- and-coming comic artist. I'll be interested to see future issues.